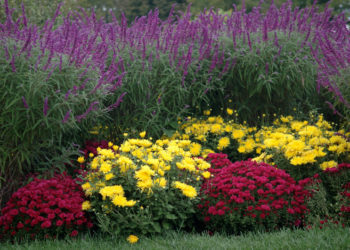 These hardy, fast-growing herbaceous perennials do best in moist soil rich in organic matter. But they will also grow in average medium to wet soil. Soil pH should be 6 to 7. They like full sunlight and good air circulation and need regular, deep watering. Avoid windy locations or use a stake or cage to hold them upright. Propagation: Division of woody crown is challenging and best avoided. Description: These tropical flowering plants grow 3 to 8 ft. tall and 5 ft. wide. Hardy Hibiscus plants only stay green year-round in areas without frost. These perennial plants have red, white, pink, or bicolored blooms and triangular leaves with saw-tooth notches. They bloom late (July) and right up to frost. Fertilizer Needs: For the best bloooms, fertilize every 14-20 days with Jacks Blossoms Boost. Maintenance: Low. Similar to daylilies, Rose Mallow flowers last only one day, then turn to mush and clump together. Deadhead before this happens. Stems need to be cut down in the late fall for new spring growth, read how here. Hardy hibiscus responds to pruning before flowering to create fuller plants. This may also help avoid early Japanese beetle damage. Water Needs: In the first growth season, follow a regular schedule to set deep roots. Afterwards, regular moderate watering will do. In extreme heat, water more often; if soil dries out, leaf scorch sets in.